CPRM is a Canadian-Filipino Radio on the internet, created here in the heart of Montreal, province of Quebec. It is created to give entertainment and connect Filipino people, family, relatives and friends around the world through Music. People who were miles away from their loved ones due to work or for any other reasons, hearing every day to foreign language make immigrants and foreign workers more hungry of their very own music. The creation of CanadianPinoyRadio-Montreal (CPRM) aims to fill in the hunger of most Filipinos who are home away from home. Aims to give tribute too, to the language of the motherland, preserving and remembering those various traditional and modern music of the Filipino great composers and singers. As a new generation of singers, composers, and artists tend to emerge in the international venue of their individual craft would result in the extinction of the heritage. CPRM now an SOCAN licensed new media, plays to you those old and new favorite songs of our famous singers around the globe as requested by our listeners. Filipinos are great music lovers so that you can hear songs from yesterday’s hit, unfamiliar to the present generations’ music. Playing novelty songs from the different regions of the country, put colors to the air of our listeners and brings back a thousand memories. As we expand our service to all, sharing the message of writers and/or composers, we also help spread and preserved those valuable and commendable arts and works, the product of one’s culture and tradition. 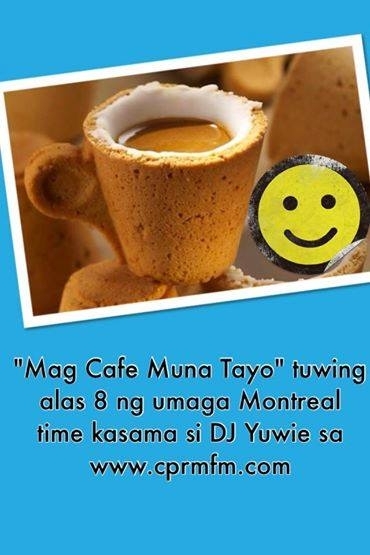 Canadian Pinoy Radio-Montreal is run by a group of OFW’s and Immigrants.